The U.S. Marine Corps Reserve Toys for Tots Program was established 60 years ago in Los Angeles, Calif.
Highland County Toys for Tots will host its annual Community Christmas Concert on Sunday, Dec. 9 at 3 p.m. at the Southern State Community College Theater located at 100 Hobart Drive, Hillsboro. Each attendee should bring one new, unwrapped toy for a donation as admission to the show. This year’s event will help the local Toys for Tots program put toys around the Christmas trees of financially insecure households in Highland County, putting smiles on the faces of more than 500 children. “Following our first concert event, community members were quick to request that we make this an annual gathering, so we’re happy to bring it back this year, bigger and better,” said Bronwyn Jones, event organizer and board president at Samaritan Outreach Services, which organizes the local program. The evening will feature performances from Christopher Ford and Eliza Kohl; the SSCC Theatre Company’s Shane Taylor, Zanna Haines and Emma Horick; The Paxton Theatre’s Tim Koehl and Madison Hatfield; Samaritan Outreach’s Bronwyn Jones and Sherry Barber; flutist Jenny Harner; and more. The event will also feature sing-a-longs, games and official sleigh tracking from Buckeye Country 105.5’s Bryce Matson as Santa makes his way from the North Pole to Hillsboro to take part in the event. For those who would like to donate but can’t make Sunday’s concert, a toy drive will be held at Westview Motors, 1585 N. High St., Hillsboro, from noon to 3 p.m. Saturday, Dec. 8. For additional information, a complete list of toy drop locations, or to make a monetary donation to the local campaign, visit Highland County Toys for Tots online at www.highlandcountytoys.com or call 937-393-2220. Toys for Tots began in 1947 when Major Bill Hendricks, USMCR, and a group of Marine Reservists in Los Angles collected and distributed 5,000 toys to needy children. The idea came from Bill’s wife, Diane. In the fall of 1947, Diane handcrafted a Raggedy Ann doll and asked Bill to deliver the doll to an organization, which would give it to a needy child at Christmas. When Bill determined that no agency existed, Diane told Bill that he should start one. He did. Since its inception 60 years ago, the U.S. Marine Corps Reserve Toys for Tots Program has distributed more than 313 million toys to 151 million children. 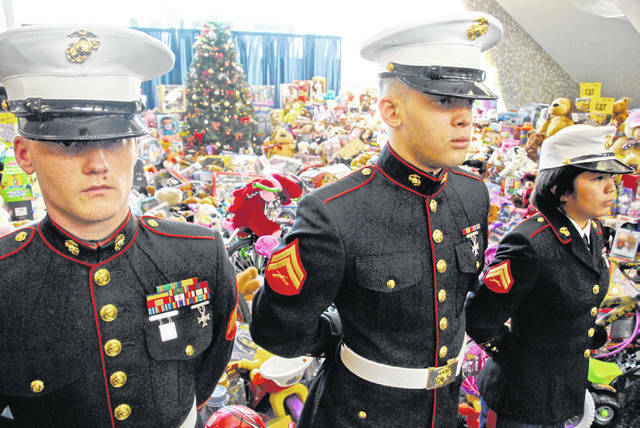 In addition, the Marine Toys for Tots Foundation has supplemented the collection of local campaigns over a 13-year life, providing more than 47.4 million toys valued at $243 million. Information for this story was provided by Wade Hamilton, director, Samaritan Outreach Services; assistant coordinator, Highland County Toys for Tots.